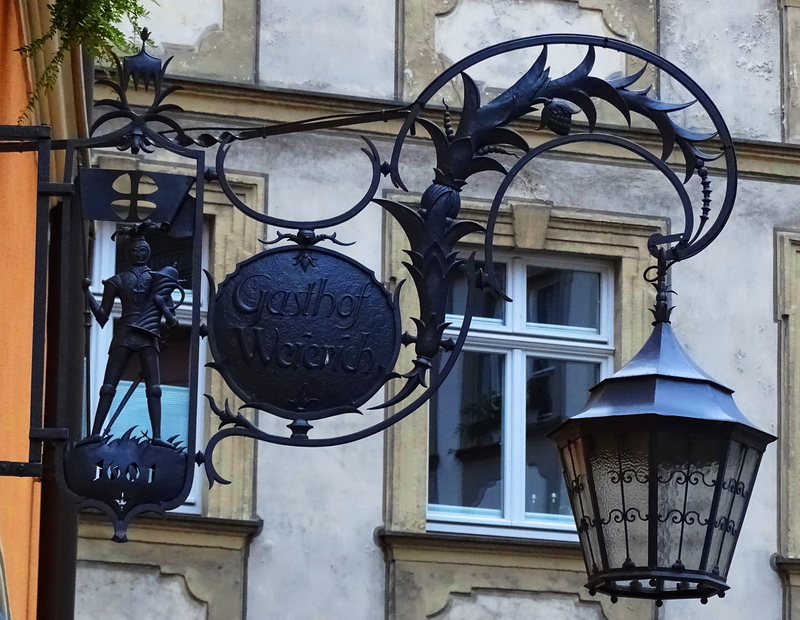 I promised you more of the intricate and immensely charming Germanic Street signs one finds while strolling in medieval towns. This one is in Nuremburg Germany. 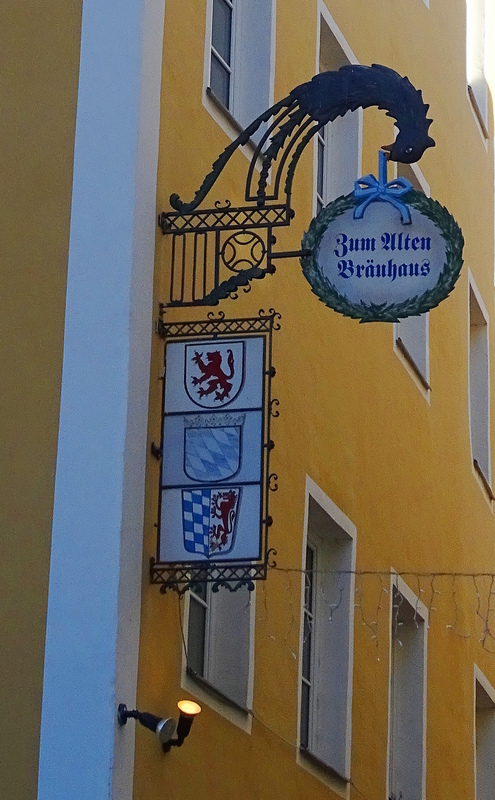 New Merchants have continued the medieval sign tradition in these remarkable old towns. Bamburg Germany. Some are clearly newer. Melk Austria. 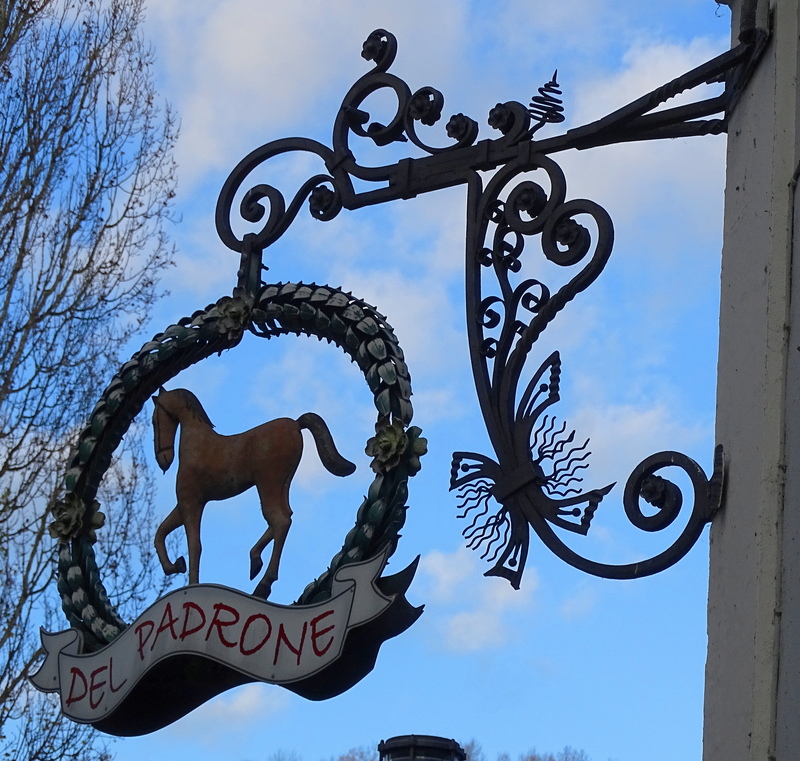 In Medieval times, many people were illiterate, hence the necessity for the visual imagery of these signs. 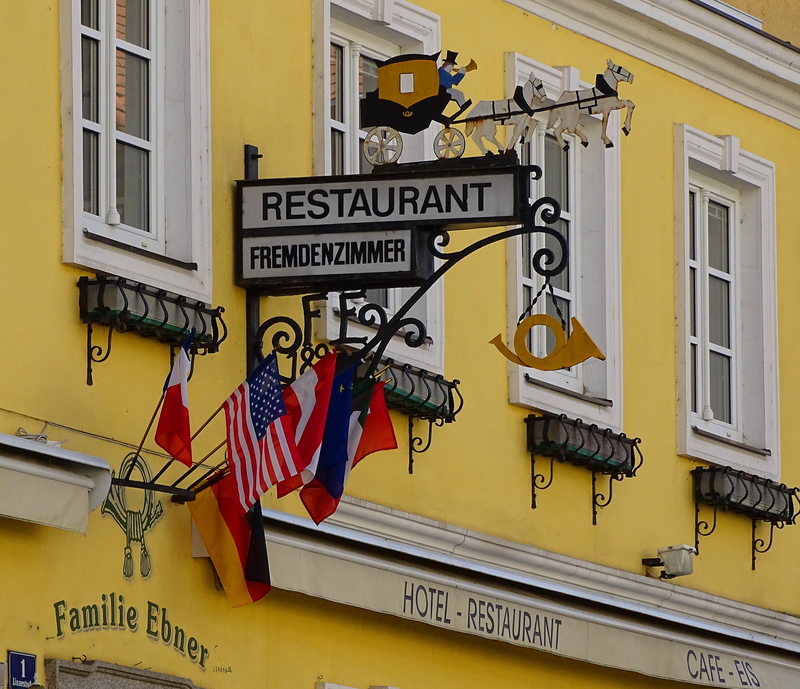 Krems Austria. Maintaining the tradition of advertising with these signs gives one the incredible feeling of walking back in time. Regensburg Germany. 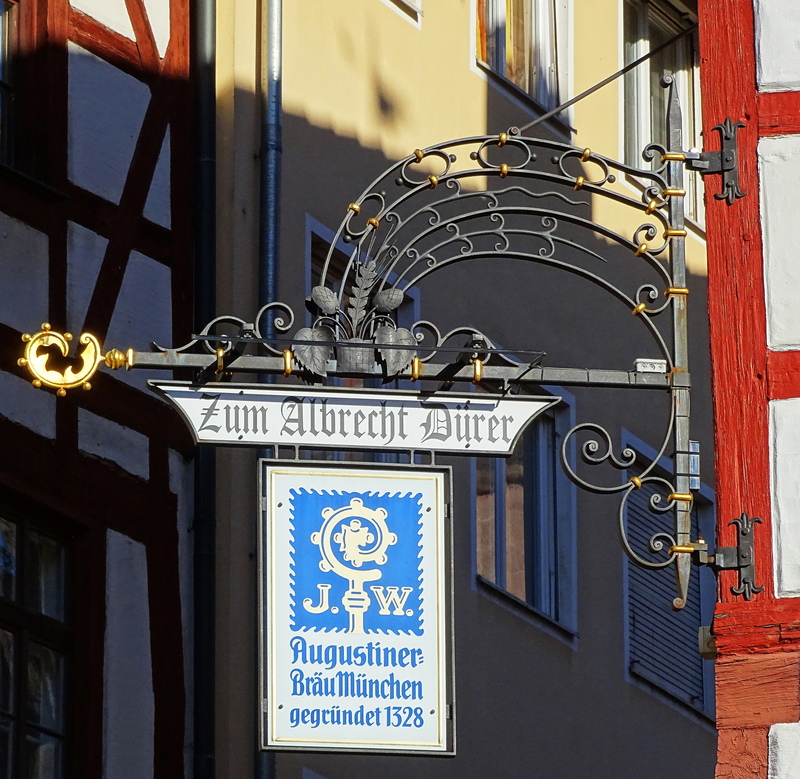 This sign is on Albrecht Durer Street in Nuremburg, Durer’s home town. Some signs are clearly older. 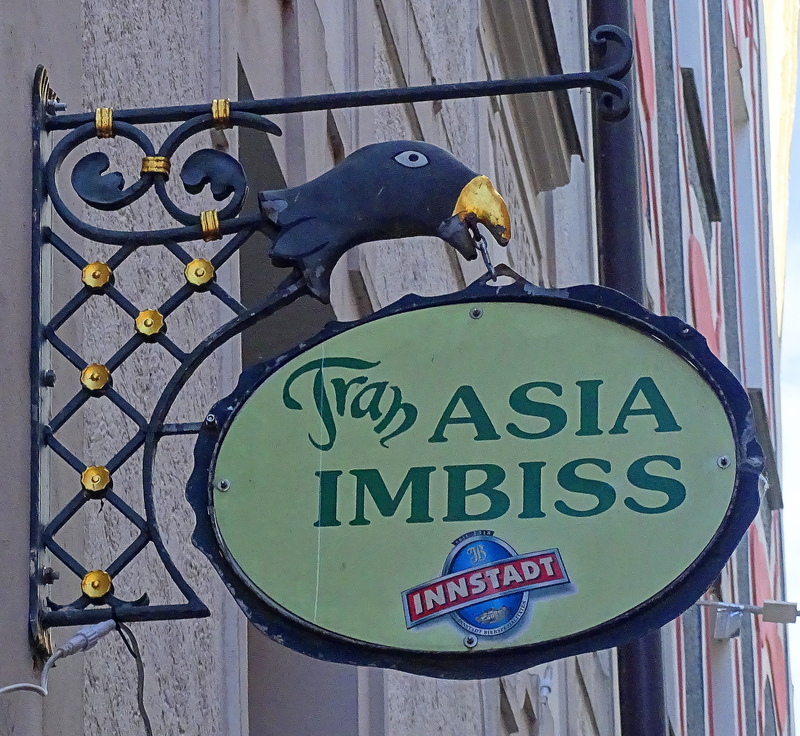 Passau Germany. I am impressed with the care taken by people in these old towns, over generations, to preserve these amazing art forms for us to wander by and admire. Passau Germany. It is also heartening to see newer signs keeping the art form alive. Passau Germany. 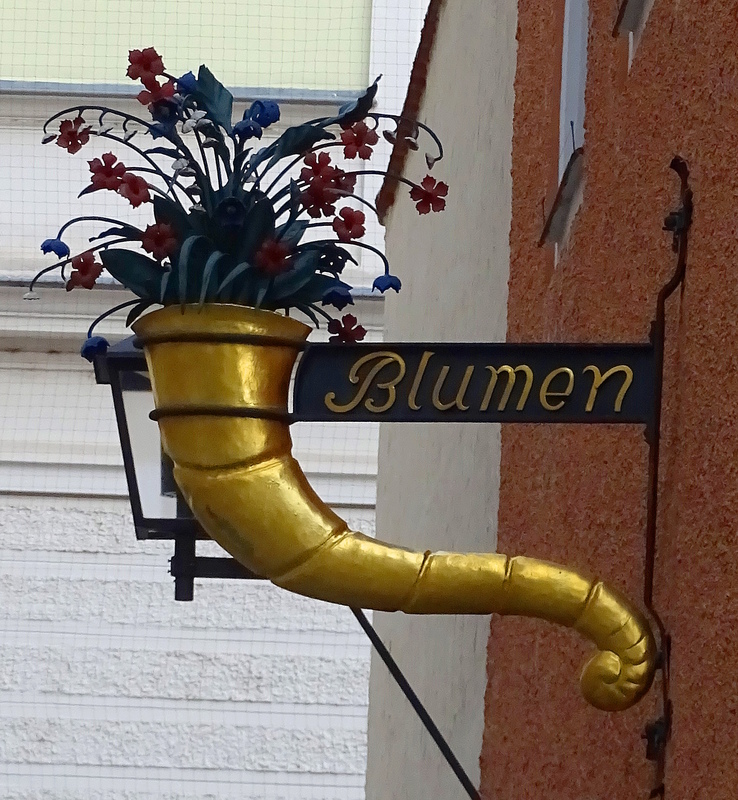 Great signs, I especially like Blumen, Cindy. Thanks for sharing some of the sights with us. Very impressive. All so unique, and all metal, they must be incredibly expensive to produce. That is very specialized sign art. I know there is a museum in Austria that houses some of the older medieval ones. People who want to acquire an old one, must pay a very dear amount. Even just having a new one built is pricely, so you can see the communal committment to preserving the art form. These are really pretty and interesting too. Are they in many German towns or only a few? I’ve never seen them, but I guess I’ve only been to the cities. 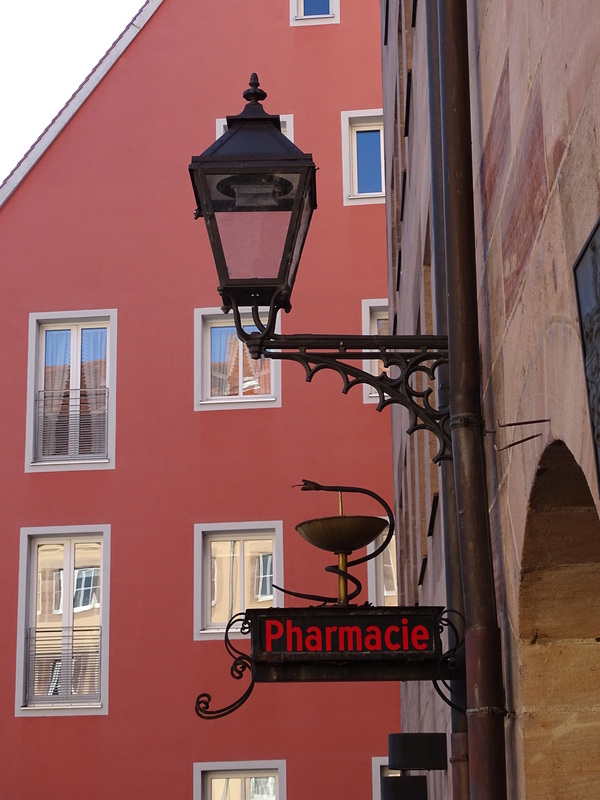 You can find these signs in many old medieval towns all over Europe. The largest collection of conserved signs are in German speaking countries which is a visual feast because one cobblestone street my have 20 signs on it. Hi Cindy: I must have seen them in the older towns of France, Spain and Italy. How interesting they are. Incredible…love it, Cindy…thank you very much for sharing!! I don’t know what it is, but I’ve always been fascinated by old street lamps, hanging shingles, and flags hanging from the side of quaint little shoppes. Delightful post of photos, Cindy. Well it is a combination of super welcoming symbols saying here we are! We are lighting your path. Come look at us. I love this imagery too. Yes, I agree with you. It is like walking into the pages of a fairy tale! Lovely. I tried to pick out a favorite and there were too many! Same, and I just want to photograph more! I agree with you on both counts we have lost too much of value! The signs are wonderful. The old towns are so lovely. It’s delightful to see that modern merchants are so committed to carrying on the tradition of the shop sign. The medieval ones, however, have an intricacy to them and a way of telling a story that doesn’t get replicated with the modern versions. 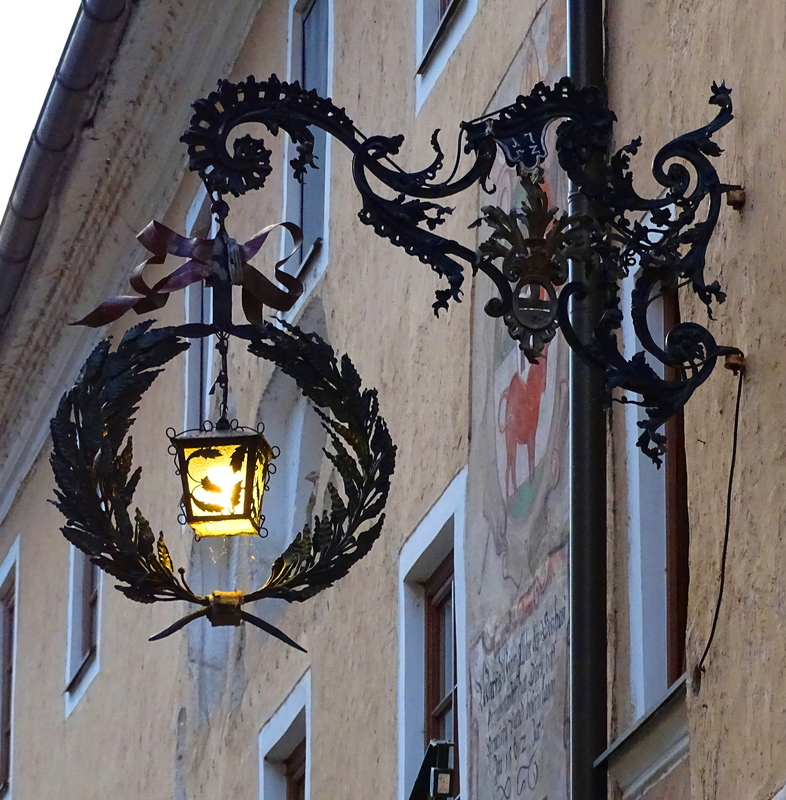 Lovely capture of the wreath and lantern one in Krems, Austria. Fantastic photos of my homeland!! Fabulous cities and a photographer’s dream! Yes, exactly what we did! It does take you to some incredible places. We stayed in Amsterdam and Budapest before and after. It was particularly lovely with all The Christmas Markets, and no tourists since it was late November. Be well my friend and so happy to learn I was following in your footsteps! Some more beautiful artwork…thank you, Cindy, for sharing these! And I barely scratched the surface. 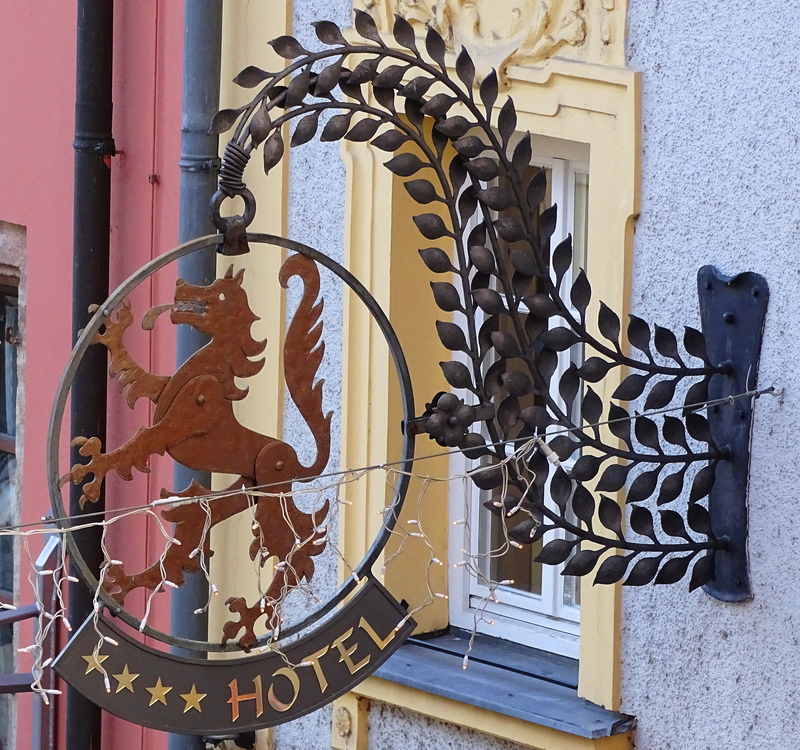 It would be so much fun to devote a trip to finding and photographing them all over Europe! OH we need some bling to wash away all the bright lights of our now busy shopping area I loved it more when I came here in the 80’s so I do what I can to make tiny spots with the #gardenclub shine brighter this year all the Roses will be so beautiful. So glad you see them as I do and thank you! I must show my hubby these, he’s a Chilean-born German who has visited all cities in Germany! These are very cool! Almost miss this one… Beautiful signs, Cindy. Thank you Amy and hope you are having a wonderful holiday season! Gratitude for your thoughtfulness. Happy Holidays! Wonderful photos. Are you in Germany right now? with love for you and your family.. I will check out her blog Sherri, thank you for the suggestion. WordPress is always doing something different. I have learned to ignore it. Be well my friend and Merry Christmas!